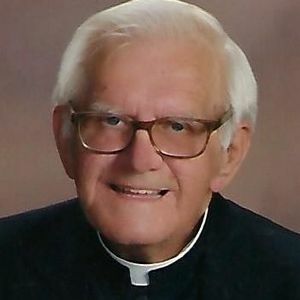 Reverend Monsignor Douglas Dushack entered eternal life on Friday, March 15, 2019 at the age of 73, at Agrace Hospice in Fitchburg. He was born on December 21, 1945 in Madison. After attending Sacred Hearts of Jesus and Mary Parish Grade School in Sun Prairie, Msgr. Dushack continued his high school education at Sun Prairie Public High School. He started his collegiate studies at Queen of Apostles Seminary, Madison, continued at Holy Name Seminary, Madison, and finished his collegiate studies with a Bachelor of Arts in Philosophy at St. Francis Major Seminary, St. Francis. Msgr. Dushack studied theology at St. Francis Major Seminary, St. Francis, and was ordained to the priesthood by Most Reverend Cletus F. O'Donnell, Bishop of Madison, on May 12, 1972 at St. Raphael Cathedral, Madison. Msgr. Dushack began serving in the Diocese of Madison as a Parochial Vicar at Sacred Hearts Parish, Reedsburg; St. Raphael Cathedral Parish, Madison; St. Henry Parish, Watertown; and St. Stanislaus Parish, Berlin. He was the Parochial Administrator of St. Joseph Parish, Berlin, and St. Thomas Aquinas Parish, Madison. Msgr. Dushack was Pastor of St. Michael Parish, Berlin; St. James Parish, Madison; and St. Bernard Parish, Middleton, from which he retired in 2015. During his years of service to the Diocese of Madison, Msgr. Dushack served as a Chaplain to the Madison Serra Club; Liaison with the Diocesan Charismatic Groups; a Member of the Conciliation and Arbitration Board, Presbyteral Council, Priest Personnel Board; and lastly, as Vicar for Priests. He is survived by his brothers Richard (Dorothy), James, and Dennis; sisters Ruth (Orville) Frank, Judy Volkmann, Linda Gladem, and Donna (Dan) Wells; brother-in-law Ernest Johnson and sisters-in-law, Janet and JoAnn Dushack and many nieces, nephews and cousins. He was predeceased by his parents, Glen and Edith (Smyth) Dushack, infant brother Donald; sister Shirley Johnson; brothers Gary and David; sisters-in-law Linda, Agnes and Brenda Dushack; and brothers in-law, David Gladem and Russ Volkmann. The Mass of Christian Burial will be celebrated at St. Albert the Great Catholic Church, 2420 St. Albert Drive in Sun Prairie, on Thursday, March 21, 2019 at 11:00 am. The Reverend Monsignor James Bartylla, Diocesan Administrator of the Diocese of Madison, will celebrate the Holy Mass, with Reverend Monsignor Donald J. Heiar, Jr., Pastor, St. Albert the Great Parish, as homilist. Visitation at St. Albert the Great Catholic Church will be held on Wednesday, March 20, 2019 from 4:00 to 7:00 p.m, and on Thursday, March 21, 2019 from 9:30 am until the start of the Holy Mass. Burial will take place at Sacred Hearts of Jesus and Mary Parish Cemetery, Sun Prairie. A funeral luncheon will take place in the St. Albert the Great Catholic Church Hall after the burial. In lieu of flowers, memorials may be directed to the St. Raphael Society Clergy Retirement Fund, Diocese of Madison, Madison, WI. The beautiful and interactive Eternal Tribute tells Monsignor's life story the way it deserves to be told in words, pictures and video. If more priests were like Fr. Doug the Catholic Churches would be overflowing. When I was in Fr Doug's presence I new God loved me and forgave me for whatever I had done wrong. We belong to St. Bernard's Parish and enjoyed Msgr. Dushack sermons. Our family will forever be grateful to Monsignor Dushack. With his gentle words and presence, Msgr. Dushack became a part of our family and guided my parents as they faced my father's chronic illness, decline, and passing. Father Doug remained a source of reassurance to my mother and I cannot say enough how thankful we are to him. I will not be able to pay my respect in person. He is in my thoughts and prayers. Blessings to your family. We were parishioners at St Albert's when Msgr Dushack came to us. We have been SO blessed by his saintliness and wonderful sermons. We are out of state, so we will sadly miss the visitation & funeral. He will be missed GREATLY! Fr. Dushack served at St. Henry's Catholic Church in Watertown, WI when I was in grade school in the early to mid 80s. I have fond memories of him then. He was very caring, jovial, and gregarious. He delivered some of the best sermons I can remember by relating the gospel to everyday life in a way that was engaging and relevant. I attended mass and went to confession with him decades later at St. Bernard's in Middleton before seeing him at St. Albert's until recently. He will be missed. May he rest in blessed peace, now with God. Sincere sympathy to the family and friends of Father Dushack. I remember him from when we were children, church services, holy communions, baptisms, weddings and funerals. A compassionate, caring man with a sense of humor. May he Rest In Peace with the Lord now. I want to express my sympathy & prayers in the loss of your brother Fr Doug. I had the privilege to work with him at St Bernard's in Middleton as his front desk secretary. He was one of a kind and a man who lived life to the vows he took in the priesthood in loving & serving the Lord & sherparding his flock. In the few years I had the honor to work for him he talked highly of his family & he shared many stories. His dog Benji, the daily Jumbo puzzle, his afternoon rosary walks,fighting with his computer to have it do what he wanted , his reliable typewriter, trips to his trailer, changing his hairstyle from perm to straight, sharing old fashion drinks & getting to visit with him on trips he made to Florida are many memories I have and will cherish. May you all fine peace and comfort knowing he at rest in the hands of his maker. Monsignor Doug was my priest for several years & performed my marriage ceremony & my fathers funeral. He was such a kind & soft spoken man. His wisdom was always underplayed by his humble & quiet demeanor. I will forever hold him in the highest esteem as a man & a man of God. Rest In Peace Monsignor. You will be missed.